Assignment Workflows is an option to create an Assignment with multiple steps (states). 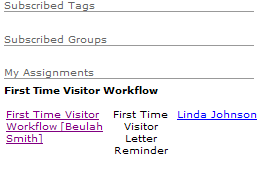 Users have the option to start an Assignment Workflow on the Person Detail or the Assignment Entry page. 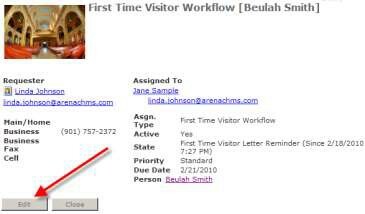 •Send a First Time Visitor letter by a Specific Worker. •Send a reminder email to the Specific Worker when the State is not changed within 2 days. 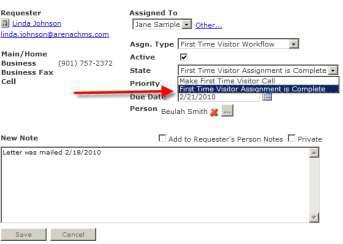 •Make a First Time Visitor Call by a Specific Worker. 1. Go to the Person Detail page for whom you want to create an assignment. 2. Select the Workflow (Assignment) you would like to start for this person. This is not the person being assigned the Assignment, but the person for whom the Assignment is being done. 3. Click the Start Workflow icon. The page refreshes and Arena confirms the Workflow has begun. The worker selects the Assignment. 4. Click the Edit button, once you are ready to make a State change. 5. Change the States, as needed for this Workflow. 6. Click the Save button. The worker for the next State receives an email. Repeat steps 4-7 until the Workflow is Complete.